T-ball ruled our lives for 3 months, every Monday and Saturday, from March to June. I watched the kids throw, catch, hit and run around with their friends. And when the season ended, a few of the other team moms and I wanted to gift a little something to the team. The coaches bought the kids cute bobble-head trophies and medals, so we decided to gift them collages. At first, one mom offered to print photos and make a DIY collage. 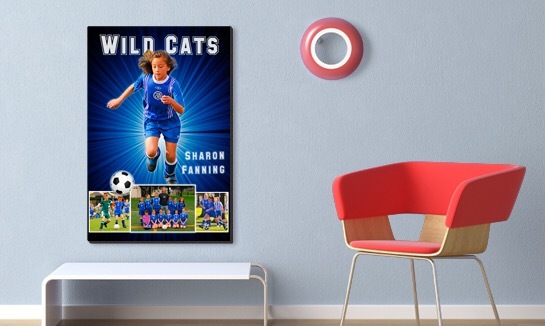 While we all loved the idea, we knew that project would take hours – with over 20 kids on the team, plus 3 coaches, we didn’t want anyone to sit, cut, glue and shop for frames. Luckily, someone mentioned PosterMyWall. Thank goodness!!! The site was easy to use, and with a little help from their gallery of templates and online tools, we were able to create two different types of collages. For each player, we made of a collage out of the best team candids. To personalize each kid’s gift, we added their team solo pic, name, number and team name/year. We used the site’s Color Pop feature to make each individual stand on their respective poster. It looked pretty cool.